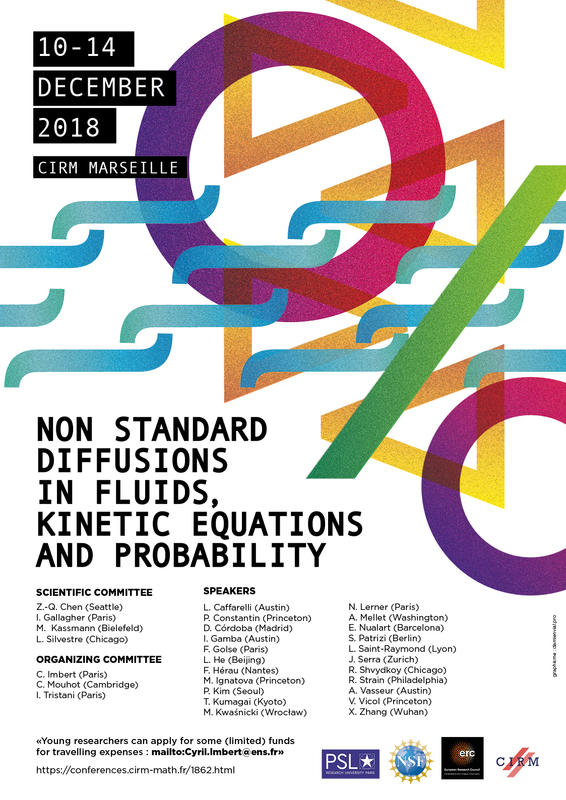 A conference entitled Non stantard diffusions in fluids, kinetic equations and probability will take place in Marseille at the Centre international de rencontres mathématiques. This conference aims at bringing together experts from different subjects in mathematics that share the common theme of nonlocal diffusions, building bridges between these communities and fostering collaboration. From the probabilistic point of view, standard diffusions refer to the Brownian motion or more generally to diffusion processes (that is, Markov processes with continuous paths). The study of Markov processes with discontinuities leads to anomalous / non-standard diffusions. From the partial differential point of view, they correspond to integro-differential operators. The most classical example is the fractional Laplacian. This is an area of research that has been extremely active in the last ten years. The field is expanding. Its applications are reaching other subjects, including fluids and kinetic equations… read more.